On any ordinary day, SFC’s coveted Founder’s Hall is the backdrop for various gatherings, film screenings, Q&A sessions, and innovative speeches. And on Friday night, it continued its service as a setting for academic discourse by hosting the St. Thomas More Pre-Law Society’s 2nd Annual Town Hall Discussion, where candidates for leadership positions within the society, gave speeches laying out their agendas and fielded questions from an engaged audience of society members, alumni, friends & family. The event embodied a core value of the Pre-Law Society, that being civil democratic practice, which, is intimately tied to the law in the American pluralistic society of which we reside. And so, the society is successfully preparing members to be active citizens by acquainting them with practices that will only serve to benefit them in whichever legal profession they may pursue. Yet, beyond that, democratic practices like this town hall makes one’s voice heard allowing for a true presence in the decisions that will affect you directly. They also allow for accountability and questions originating from critical thinking, the latter here being a vital skill for studying the law, and thus one that members really began exercising at this event. Incumbent Secretary of the Treasury, Kelvin Nolasco, took the podium first, and while his message was brief, it was firm and transparent – two qualities that many appreciate in a leader. Nolasco will continue to secure Pre-Law merchandise for members, which will help advertise the society around campus, and not to mention, instill a sense of pride in members as they flaunt their status in the group. The Secretary also wants to work towards allowing funding for the society from outside, private donors, such as alumni. Candidates for SACOR (Student Assembly Core of Representatives) Secretary, Rebeca Oliveira, the current Top Advisor to the Secretary of the Treasury, and Ryan Elkassem, the current Chairman of the Debate & Discussions Committee took the stage next. The race for SACOR Secretary is one of two competitive races in the society this year, with the other being Secretary of Society. These contested elections serve to give members a choice, and in the case of the SACOR elections, members have a difficult choice up ahead. Both Oliveira & Elkassem exhibited great poise at the podium, relayed well-planned, extensive agendas for their ideal future of the society, and spoke confidently to their leadership abilities & qualifications. Oliveira laid out her plan to prioritize the use of social media in recruiting new members, keeping established members up to date and active in the society, and initiating the posting of features on members that would appear to resemble the “Humans of New York” project. The candidate also stressed her intent to work with the Student Government Association (SGA) on collaborative events, such as fundraising to combat homelessness in the surrounding community & voter registration drives. Elkassem, while agreeing with Oliveira on many issues & ideas, managed to still set himself apart from his opponent when he explicitly presented his “Five Fold” agenda. The five points he emphasized were the creation of a civics association, a new outreach program, an assertive relationship with the SGA & general school administration, cooperation with other Pre-Law branches, and the revitalization of the organization of the SACOR department. 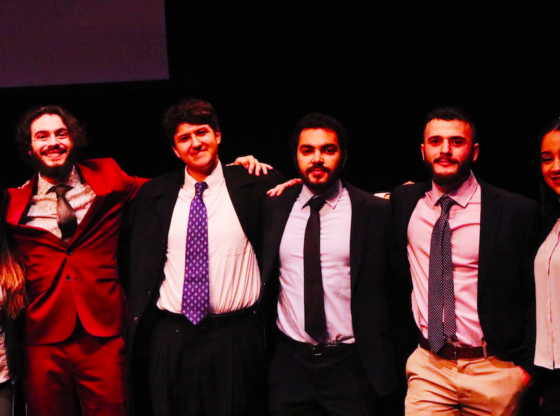 Elkassem also informed the audience of his plans to utilize his connections at the United Nations to set up a program on campus where politicians, state department officials, UN & diplomatic officials would come in to speak or participate in networking events. And before the two candidates left the stand, they did something that has ceased to exist in our current cut-throat political environment – they both agreed they’d be happy to see the other in the role of SACOR Secretary, acknowledging the qualifications of one another. It was refreshing to see such a civil democratic competition unfold: one that could set the precedent of how a democratic election should be held, within this society, and beyond. The candidates for Secretary of Society stepped up front next, both presenting original ideas after ideas, all within the sphere of the organizational and administrative duties that the position holds. Rachelle Mejia, the current Top Advisor to the Secretary of Society is looking to take the next step and claim the title she has been working towards. Mejia is seeking to work closely with other executives on recruiting new members, keeping current members active by closely monitoring attendance, and providing up to date information regarding the society on the college’s website, if elected. Mejia faces an opponent, Gabby Smalls, Chairwoman of the Pre-Law Journal, who also wishes to prioritize organization within the society, and has similar ideas regarding a website to do so. Smalls would like to create a separate Pre-Law website entirely, which would be dedicated solely to the society and would be kept up to date with upcoming events. She also hopes to arrange trips to visit law schools. After these two exceptional candidates came the final two positions generating a lot of excitement, despite them being unopposed in each of their races: the Vice Presidency & the Presidency. Stefano Forte is the current Interior Secretary, and the glue that holds this society together. Forte’s kindness and welcoming nature has surely helped foster a familial aspect to the society that all members feel. His dedication to the group is palpable, and he will undoubtedly make an excellent Vice President. The soon-to-be Vice President revealed many plans for the future of the society, including the likely formation of a Pre-Law Alumni Association, which would serve to benefit current members with networking & mentoring opportunities. Forte responded to many questions from the audience, answering them formally and directly, and in doing so, assured that he is more than capable of being a democratic leader. There’s no doubt that with or without a challenger, he would receive overwhelming support. And last, but certainly not least, was the man of the hour, President Nicholas Vitrano, the proficient and trustworthy leader running unopposed for re-election. President Vitrano first took the time to shout out Forte, his VP candidate, saying their close friendship will serve to make them a dynamic duo. He proceeded to give an eloquent speech in which he highlighted the importance of cultivating relationships during one’s undergraduate career. From professors to fellow classmates, Vitrano urged members to really make the effort to network, as doing so can only help, post-graduation. Furthermore, President Vitrano has a novel approach in mind on how to advertise the Pre-Law Society that involves marketing it as a commodity: to be a part of it is valuable in the economic sense of securing future opportunities, not to mention it’s intellectual value that’ll be taken away at the least. And as Vitrano took questions from the audience, a bright-eyed, wise beyond his years 6th grader who wishes to attend SFC and law school himself, looked to the President for important advice – advice that many other members are looking for themselves. The young student asked what classes should one take, and what subjects should they be well read in to be successful in the law. with that, you cannot help but be successful in whatever you do, especially in law school. Elections will take place on Monday, April 1st.